3/27/2012Share this story on Facebook! Participate in student organizations, including NABA, the Ithaca College Accounting Association, and the Beta Alpha Psi honor society. Take on leadership roles in organizations or within the School of Business at large. Put class into practice through the Volunteer Income Tax Association (VITA) program and/or internship. To be honest, it took a while for me to adjust. I'm from Barbados, and I missed my family. But things began to change at the beginning of the spring semester of my freshman year when I was invited to the induction ceremony of the accounting and finance honor society, Beta Alpha Psi. There I found people and an organization that sparked my interest. One alumna in particular reached out to me that day and became my first professional business contact. Another Caribbean native, her experiences had been similar to mine, and her successes jolted me toward mirroring her accomplishments–academically and professionally. Not only was she an academic champion for me, but also introduced me to the National Association of Black Accountants (NABA), which aims to enhance opportunities for minorities in accounting and business. In no time, NABA became a outlet for me to challenge myself academically, and I was afforded the opportunity to attend the organization's Eastern Region Student Conference (ERSC)–twice. Excited by my experiences at ERSC, I used what I learned there to further develop myself academically. 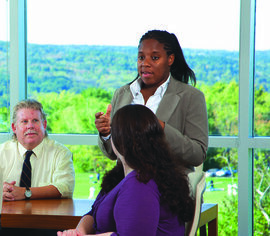 One of the clear benefits of an Ithaca College education is the willingness of most faculty members to invest in their students–in and out of class. I've never had professors here who simply cared about my grade in the class. At IC they care about whether I'm growing, whether I'm learning, whether I'm getting something out of the experience. This became even more clear when my team from NABA began to prepare for the NABA-Deloitte Case Competition last spring. This competition challenges New York student chapters of the NABA to research and present a business case to Deloitte partners, principals, and directors for a cash prize. We relied on the faculty to provide us with sources of information, to teach us bits of advanced accounting–a class most of us hasn't taken yet– and review a dress rehearsal presentation. The prep work and coaching, and the comments and critiques, readied our team for a strong presentation about a current accounting issue. We took a second place in the competition, but it meant so much more than that. I had been accepted into Deloitte's internship program for the summer, and this presentation was one of the few interactions I would have with Deloitte professionals before then. When summer arrived, I was anxious about working side-by-side with some of the "best and the brightest" business students. In some ways, even with all my experience, I wasn't sure I was ready to intern at Deloitte & Touche, the audit branch of Deloitte, in New York City. However, as the days–then weeks–went by, I realized just how ready I was to excel at my future career after successes at my internship and at Deloitte's Northeast Regional Intern Case Study competition. I know Ithaca College has prepared me well. I've taken a lot of classes and done a lot of things that have pushed me to see another worldview, another way of looking at things, another angle. That's been incredible. I think about the person I am now versus the person I was when I started my interactions with NABA, and I realize that I'm remarkably different. I am 3,000 times more comfortable with public speaking, and I am a lot more confident. My future employers recognized my confidence as well. This fall I will start my full-time job at Deloitte, and this time I'm more excited than anxious.